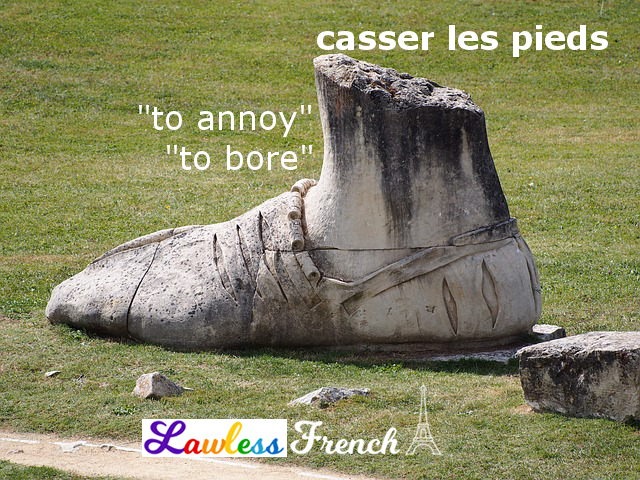 Usage notes: The informal French expression casser les pieds à quelqu’un has two different meanings. It can mean to bore someone stiff, or it can mean to annoy someone, get on their nerves. While it is annoying to be bored stiff, I still think those feelings are pretty distinct, and it’s kind of funny to have them both in the same expression. Besides, neither meaning seems to have much of anything to do with broken feet. Extreme boredom makes me think of fatigue and a certain itchiness; the only relationships to feet I can think of are shifting from one foot to the other, and of course an overwhelming desire to run away. So maybe your feet are broken because you can’t run away? On the other hand, annoyance brings to mind heated tempers – and possibly a desire to kick the annoyer. No broken feet to be found anywhere. Je déteste François – il me casse les pieds ! I hate François – he really annoys me! Ce prof casse les pieds de tous ses étudiants. That teacher bores all of his students. Selon ce lien (http://sedonnerlemot.tv/loft/pdf/11fiche.pdf), au XIIe siècle, on disait rompre la tête, rompre le dos. Au XVe siècle, on disait casser la cervelle, puis au XIXe siècle on a dit casser les pieds, casser les oreilles. Casser, c’est briser, rompre, et briser une partie du corps, c’est bien sûr dérangeant et inopportun pour celui qui en est victime.